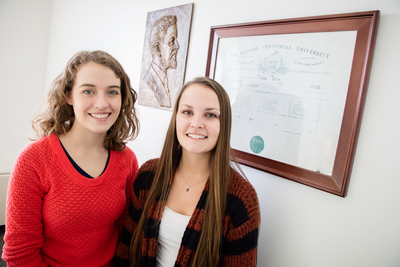 Tara Zumwalt (left) and Eve Zumwalt’s family has been attending Illinois for more than 140 years. Tara Zumwalt grew up in Iowa, and she always assumed she would attend Iowa State University like her mom. But when she started looking at various colleges around the country, she became interested in the University of Illinois at Urbana-Champaign, the school her dad attended. Her dad always talked about his great experiences at Illinois, but he never put any pressure on her to attend his beloved school. While going through the college search process, Tara learned more about her family’s Illinois history. If she decided to attend Illinois, she would be the fifth generation in her family to attend the school. That fact, combined with the strong engineering program and Marching Illini, led her to pick Illinois. She says it was a great decision. He and his wife Ada Mary Allen (who also attended Illinois) had 10 children. Eight of those children graduated from Illinois including Ralph Allen Jr., Tara’s great grandfather. Two of the Allen children died of influenza while they were U. of I. students. Ralph Allen Jr. graduated in 1912 with a degree in agriculture. His daughter, Martha Allen Zumwalt, graduated from Illinois in 1943 with a degree in home economics. Martha’s siblings, Anna Louis Farnsworth and Stella Orwig, also attended Illinois. Martha began dating Delmar Zumwalt while at Illinois. They soon married and eventually had five children: Gene, Ann, Connie, Clark and Jack. All but Clark graduated from Illinois, including Tara’s father, Jack, who graduated in 1985 with a degree in agricultural communications. Now Tara is a sophomore in civil engineering at Illinois and Tara’s cousin, Eve Zumwalt (daughter of Clark), is a junior in speech and hearing science. Eve’s brother Jacob Zumwalt just graduated from Illinois last year. Connie’s son Mac Zumwalt graduated in 2006. When Ann Gerdes (a fourth generation Illinois alumna) was an undergraduate, her mother, Martha, decided to return to Illinois to get her master’s degree in education. In fact, one summer the mother and daughter both lived in Illini Tower in different rooms. In 1973, they both graduated. Ann received her undergraduate degree and her mother received her master’s degree. Another year, Ann, her brother, Gene, and her sister, Connie, were all enrolled at the same time. One year Ann also had four first cousins that were enrolled simultaneously. Ann had hoped that her two children would also follow the family legacy, but they had other plans. Going back to Ralph and Ada Mary and their ten children, it adds up to a huge Illinois family tree. More than 100 family members who are direct descendants of Ralph and Ada Mary or have married into the family have attended or graduated from the University of Illinois. And even though Tara has several aunts, uncles and cousins who have attended Illinois, her position in the family is unique. Tara said her brother is still trying to decide on a major, but he’s interested in engineering. Tara said one of her favorite parts of choosing Illinois was visiting her grandma, Martha, and telling her the decision. Her grandma had endured a decline in health, but as soon as Tara told her the good news, her disposition changed completely. With family history all around, Tara said she can’t help but think about them when she walks around campus. For Homecoming every year, several members of the family come back to campus and celebrate. In 1995, the Allen family was chosen as the first recipient of the ACES Alumni Association “Family Spirit Award.” There is also a room in the ACES Library commemorating Ralph Allen Sr. and his legacy appropriately named the “Ralph Allen Family Room.” The room includes a bronze portrait of the family patriarch that was created by his daughter Lucy Elizabeth Allen, who is also an Illinois alumna. The future of the family lineage at Illinois isn’t in question, but Tara said it has crossed her mind.